Every year, there’s a battle at the top of the Android food chain. 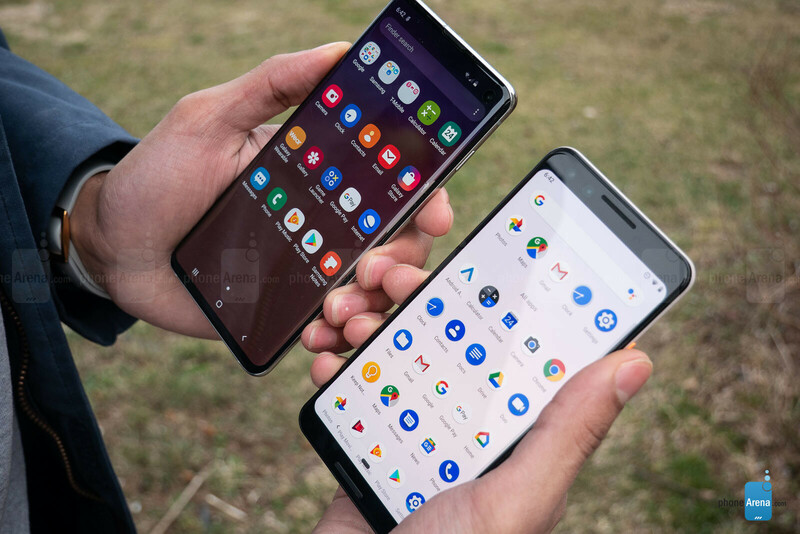 Standing at the apex, typically, has been Samsung’s Galaxy S devices, and while many of the manufacturers Samsung used to face head-on have slipped further away from potentially usurping the mighty Galaxy, Google’s Pixel devices have come ever-closer. So, naturally, we had to ask: which one is better? Comparing the design of these two smartphones seems almost unfair, but Google could have certainly done better. The S10 is arguably one of the best-looking phones out and frankly would’ve beat the 2018 Pixel 3 in aesthetics when it was still just a wee 2017 Galaxy S8. The S10’s only been refined further with ever-shrinking bezels thanks to the latest fashion trend: the punch-hole front-facing camera; and the latest in bio-metric – the in-display, ultrasonic fingerprint sensor. With the screen's curved edges flowing seamlessly into the metal frame and iridescent glass back, the Galaxy S10’s style is nothing short of eye-catching. In comparison, the thicker, shorter Pixel 3, with its lack of curves and surplus of bezels, looks like it’s a good three years behind the S10. The frosted and shiny glass back is about the most premium-feeling aspect of the Pixel 3, and even that looks rather plasticky from afar. Not to mention that the buttons are noticeably mushier and harder to press than the S10’s springy and responsive keys. Speaking of hardware, we’re looking (or rather not looking) at an ultrasonic fingerprint sensor hidden beneath the screen versus the Pixel 3’s back-mounted, plainly seen fingerprint scanner. Ultrasonic biometrics could still use some tweaking, though, as we often had to try multiple times to authenticate on the S10, whether it be due to less-than-perfect finger placement or not pressing hard enough. On the other hand, the Pixel 3 opens easily with a tap of the finger. Looks, as always, are a matter of preference, but fit and finish a little less so. This is an easy round to give to the cutting-edge, edge-to-edge style of the Galaxy S10, even with its finicky in-display biometrics – something we hope can improve over time. Shapes, hole-punches, and bezels aside, we’re looking at an AMOLED display on the Galaxy S10 versus a P-OLED display on the Pixel 3. Sammy’s done some nice work leveling out its AMOLED displays to portray more accurate colors, and that’s exactly what the natural mode does. You can still punch things up a bit with the vivid mode, though, which easily satisfies those who prefer saturated, dazzling colors without overdoing it. The Pixel 3 also portrays highly-accurate colors and offers a “boosted” color mode, but it does little to change the colors or overall experience on the Pixel 3. The Galaxy S10 not only dials in better, more distinct color modes, but it also gets a lot brighter when it needs to. We’ll easily hand this round to the S10. Samsung’s long been an avid tweaker of the Android platform, even as stock Android has become more feature-rich and pleasant to look at. Google launched the Pixel 3 with a handful of Pixel-exclusive features, mostly centered around AI, like Night Sight for low-light photography, Duplex for Google-Assistant-made restaurant reservations, and Call Screening, which screens and transcribes calls for you at the tap of a button. Samsung’s One UI, on the other hand, centers most of its additions on aesthetics and navigational functionality, as is the case with its own take on gesture-based navigation, which we found to be only slightly easier to use, but every bit as clunky as the Pixel 3’s Android Pie gesture nav, and still a far cry from the smooth, intuitive operation found on the latest iPhones. This aside, Samsung expresses a lot of artistic licensing in the S10’s UI, moving things around a bit, tweaking some functions here and there, and extending much of that customization to the user, as well. Overall, though, there’s not much on the S10 that we miss too terribly on the Pixel 3. We’ve always loved Samsung’s arrow shortcut to get to the top of a list, and a secure folder is nice to have, but that about rounds out the very short list. On the other hand, being able to screen spam callers and take night time pictures in almost impossible settings are drool-worthy features that we’d much sooner ditch our S10 for in favor of the Pixel 3. In terms of informational queries, as expected, Bixby can’t measure up to the Google Assistant’s more sophisticated search and speech-recognition algorithms, but it does do some things Google’s assistant can’t when it comes to pro-active and reactive routines. Bixby Routines and quick commands rely on phone events and verbal commands, respectively, while Google Assistant’s are triggered only by verbal cues; Google Assistant can’t initiate a routine by recognizing that phone is charging as Bixby can, for instance. Right now, Bixby’s routines are slightly more plentiful and diverse when it comes to on-device automation, bringing abilities to open particular apps, put the phone in certain states of functionality, auto-rotate the screen for specific apps, and more just based on simple “if, then” recognitions. This gives the S10 a bit of in-built functionality similar to the popular IFTTT (If This Then That) automation app. On the other hand, while the Pixel 3’s Google Assistant doesn’t get this in-depth, routines can be made to control more than on-device functions, such as lighting, thermostats, and other Google Assistant-compatible smart devices. Of course, the S10 also has the Google Assistant built in, and the Pixel 3 can just as easily download IFTTT for similar functionalities as found in Bixby’s Routines, but we do like Bixby’s native support for it right in the settings, and appreciate Samsung’s efforts in giving Bixby a more active role in simplifying your phone interactions. In the end, though, most people won’t find Bixby’s on-device functionalities to be a compelling enough sell over the Google Assistant for them to forget about trump-card, exclusive features like Duplex and Call Screening on the Pixel 3. Lifting the hood on these machines, you’ll find last year’s flagship SoC, Qualcomm’s Snapdragon 845, paired with 4 GB’s of RAM in the Pixel 3, squaring off with Qualcomm’s latest in the SD 855, or Samsung’s in-house built Exynos 9820, both with 8 GB’s of RAM in the Galaxy S10. In terms of benchmarks, the results aren’t very surprising; both versions of the Galaxy S10 beat out the SD 845-toting Pixel 3 in almost every test. Fortunately, the Pixel 3’s lightweight OS and software-to-hardware tuning make this difference all but completely imperceptible in day-to-day use. Might you start to notice some slight separation during heavy gaming or particularly intensive multi-tasking? Perhaps. But both of these devices will be plenty snappy for any user. Benchmark results like these mostly point to the Galaxy S10’s higher resilience against future advances in mobile hardware and software – the Exynos variant, especially. You might expect a clear advantage from the Galaxy S10 in the camera department, considering it has three compared to the Pixel 3’s single shooter, but more doesn’t always mean better. The S10 has a 12 MP main camera, a second 12 MP camera with a telephoto lens, and a third ultra-wide-angle camera with a 16 MP sensor all competing with the Pixel 3’s lone 12.2 MP main camera. The tertiary wide-angle camera, of course, does one trick the Pixel can’t do no matter how much software magic you throw at it, and this does come in handy on the S10 – pulling more scenery into every shot can change the photo entirely – but Google seems to think it can make up ground in the telephoto lens department with Super Res Zoom, take better night photos with Night Sight, and overall, mitigate many of the S10’s, and other’s advantages with top-level software. Between the S10 and the Pixel 3, we’d say that, for the most part, Google was right. In daytime photos, both the Galaxy S10 and Pixel 3 capture excellent shots, with plenty of detail and accurate colors – there’s not much separating the two here. Sometimes the S10’s tendency to take warmer photos helps liven-up a dreary scenery, while other times the Pixel can eke ahead with its better dynamic range. These advantages for the Pixel 3 become more prominent as lighting dwindles or becomes more dynamic – even without Night Sight enabled. 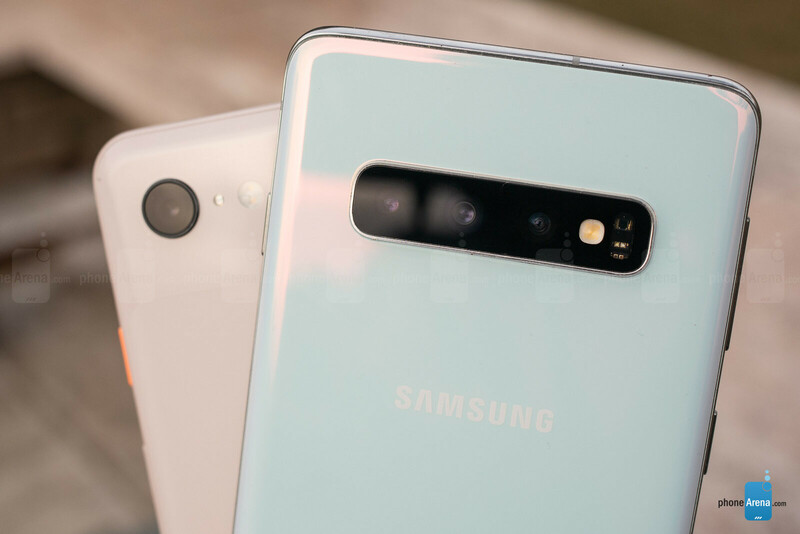 We’ll firstly say that these are two of the best phones in low-light that we’ve tested – details are maintained well, as are colors – but, the less light there is, the more discernible the S10’s digital image processing becomes. 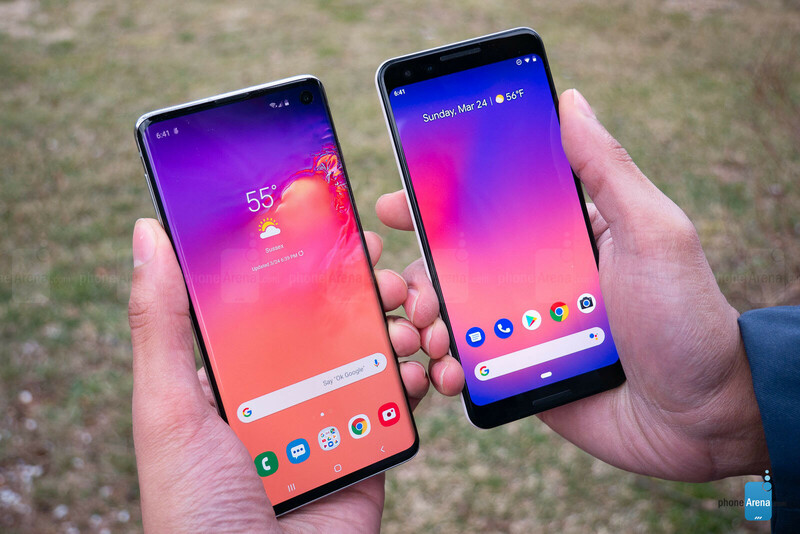 Compared to the S10, Google’s processing on the Pixel 3 often distinguishes itself as more detailed, accurately colored, and altogether more realistic. Pictures on the S10 could seem flat and overly-processed compared to the more three-dimensional textures and accurate coloring of the Pixel 3. To some extent, the more favorable result will be a matter of preference, but the more true-to-life pictures were captured with the Pixel 3. Delve into very low-light, dynamic sceneries and the Galaxy S10 will continue to hold its own well with commendable noise reduction and solid details. Zoom in 2X’s, however, and in such low-light scenarios the S10’s telephoto lens won’t activate for 2-times zoom, and instead uses digital zoom, which pales in comparison to the Pixel 3’s zoomed-in capture. Portrait mode pictures looked good on both phones in terms of blur application but, as with regular photography, the more-processed, less-realistic-looking photos came out of the Galaxy S10, whereas the Pixel 3 showed more accurate colors and textures. One of the main draws of the Galaxy S10 is the triple-camera setup and the versatility which it provides. The telephoto lens, specifically, adds 2X’s optical zoom which, in this case, is doing battle with one of the Pixel 3’s less-talked-about software tricks: Super Res Zoom, a feature which uses the unsteadiness of your hand to capture more photographic information for zoomed in photos. There’s just no replacement for optical zoom, right? Well, not in this case. Comparing zoomed-in shots from the S10 and Pixel 3 reveal that Google’s software does some impressive work, making the quality difference between the two negligible, overall. In fact, as we mentioned earlier, at night, there’s no telephoto lens that will capture what the Pixel 3 does when zoomed in – even without Night Sight many of the times – and the S10’s camera is no exception. In the selfie department, it’s the Pixel 3 that sports dual cameras – two 8 MP cams, one regular and the other wide-angle – compared to the Galaxy S10’s single 10 MP selfie cam. The S10 does try to mitigate this lack of a wide-angle camera by offering a wider shooting mode in the camera UI, but it’s nowhere close to as wide as the Pixel 3’s secondary camera can capture. In terms of capturing nice selfies, both of these phones have beauty settings which can be helpful for some to play around with, but both will take pleasing photos in their respective regular modes, as well. The S10 seemed to capture more accurate colors in various lighting, though, while the Pixel 3 has an edge with a its secondary wide-angle camera. Both the S10 and Pixel 3 capture pleasing details and their software separates objects with ease in their respective portrait modes, but we’ll give the edge to the S10 on selfies due to the more accurate color portrayal. 4K videos taken on these two look pretty comparable in image quality and stabilization. Both display a bit of shutter roll but there were no instances of artifacts and only rare stabilization glitches. Otherwise, movement is smooth thanks to optical and electronic stabilization on both. Videos look great on both, but audio captured on the Pixel 3 sounds compressed compared to the S10. This and the ability to switch between all three cameras while recording push the Galaxy over the edge for us here. Here we have stereo-speaker setups on both the Pixel 3 and Galaxy S10 which get plenty loud and immersive for video and, if you choose, audio consumption. The Pixel 3 was more prone to crackling at peak volume, while the S10 maintained better composure, and overall, crisper audio top-to-bottom. Better for audio, though, are the bundled headphones with each phone. The Galaxy S10, with its 3.5mm headphone jack and corresponding AKG headphones, make for a very good listening experience on the S10. The separately-sold USB-C Pixel Buds are quite pleasing to listen to as well, but the AKG headphones offer a bit more punch in the lower-range, while still delivering clear highs. For this, and the better-tuned internal speakers, we’ll go with the S10 on this round. All these features are well and good, but if you can’t get a day’s use out of your daily driver then it’s next to useless. Luckily, neither of these phones struggle to make it through a full day, but the S10 doesn’t cross the finish line looking quite as fresh as the Pixel 3. In our custom battery drain test, the Galaxy lasted less than seven hours of screen-on time while the Pixel clocked eight and a half – a pretty consistent theme we noticed at the end of heavy usage days where the Galaxy was prone to tapping out just a little sooner – no more than about an hour we’d say. The S10 does have one neat battery trick in Wireless Powershare, though, which allows it to charge other devices via inductive charging. It’s a nifty feature, but it’s on a phone that needs the juice itself – more than most in its price range. We’ll take the Pixel 3 this time around. 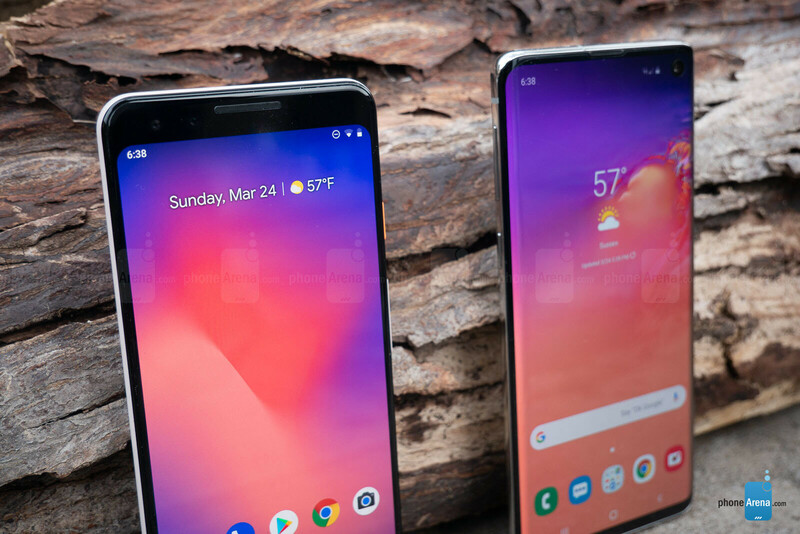 Google’s Pixel 3 and Samsung’s Galaxy S10 are excellent, top-of-the-line phones, and choosing one over the other won’t force you to give up much, but there are some reasons to pick the Galaxy S10. Firstly, there’s no competition in the looks department; the S10 is one of the most refined, modern, and head-turning devices in all of its colors. Secondly, you’re getting the latest and greatest for Android internals, with plenty of storage to boot. 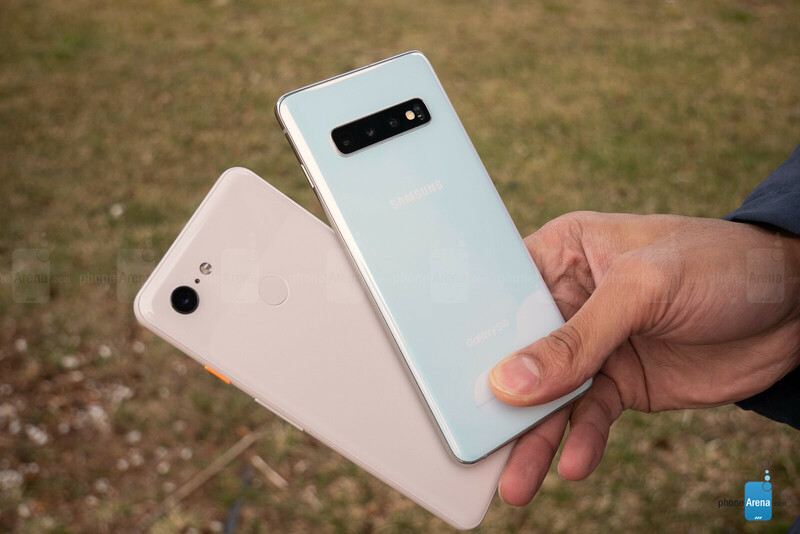 Lastly, you get the versatility of three cameras rather than one on the Pixel 3, although we readily admit the most notable advantage there is in the wide-angle camera, as the Pixel does a very comparable job of digitally zooming in a shot two times versus the S10’s optical solution. As for the Pixel 3, it’s far from the sexiest flagship, but it is rather unique-looking in its own way. Still, what’s inside is what makes the difference. In this case that means a minimum of three years of timely, major OS updates and five years of security patches, and software like Night Sight which seems to be unrivaled in what it does right now. Choosing which one to carry around for months, or even years, may not be a hard choice if you want a great-looking phone for years to come. But choosing a top-performing device for now and for the future? That’s a bit harder to discern. Wrongly-labeled pros in your conclusion. Both are great phones but I'll pick the S10. Install the Google camera app and I'll have best of both worlds. AND A PHONE THAT WOULDN'T LAST FOR MORE THAN ONE YEAR WITHOUT GETTING INCREDIBLY SLOW. IM USING MY PIXEL 2 AND IT IS SO MUCH FASTER THAN S9. Wow. 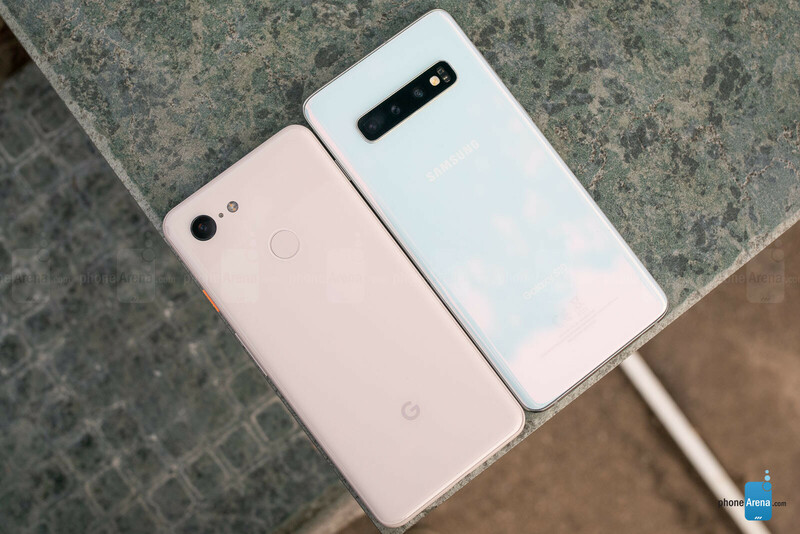 Pixel 3 looking very ancient with those huge bezels next to the S10. You can get the Google Cam including Google's night sight on the S10 with the Snapdragon. So Samsung clearly wins if you have that version. The S10 is better I agree BUT it's also 140 euros more expensive (in my country).